Grand Prix Express supporting T4U shoe box appeal collection, storage and onward shipping for more than 20 years, proud to help T4U make a difference!! 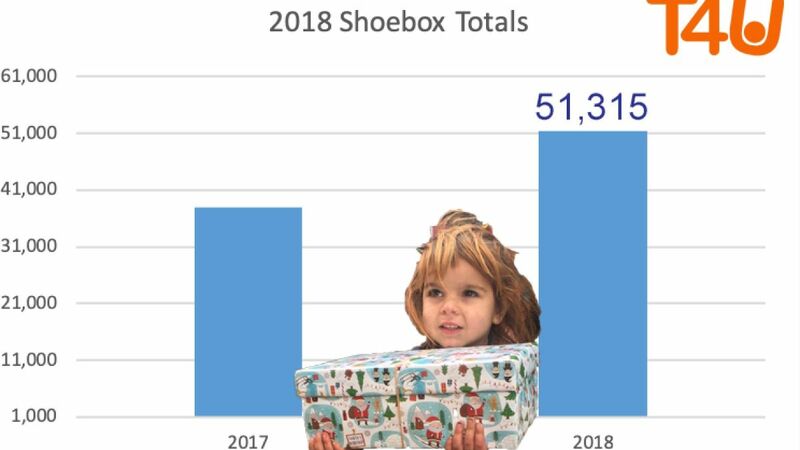 We are so excited to let you know that we not only hit our shoebox target but exceeded it! 51,315 Shoeboxes have/or are heading to Eastern Europe this year! Where did your shoebox go? Your shoeboxes have travelled far and wide, heading to four areas of Romania: Oradea, Cluj-Napoca, Bralia and Tulcea; whilst over 16,000 boxes went to orphanages and those in the care of the government in the Minsk area of Belarus. Our last load will head out shortly to Breza, Bosnia to be distributed by the Red Cross.